Print large, beautiful photographs with the compact and stylish XP-960. Featuring a six-color Claria Photo HD Ink-set, it can deliver fabulously detailed A3-sized prints and photos. It's versatile too; Epson Connect offers users a whole suite of mobile printing options. Print in sizes up to A3, scan and copy up to A4. Print large, beautiful photographs with the compact and stylish XP-960. Featuring a six-colour Claria Photo HD Ink-set, it can deliver fabulously detailed A3-sized prints and photos. It's versatile too; Epson Connect offers users a whole suite of mobile printing options. The Epson Micro Piezo print head is at the heart of every Epson inkjet printer. It produces superb colour and clarity at high speeds and is central to the changing world of professional and amateur photo printing and print-on-demand business. The print head also helps to minimise impact on the environment because it uses ink very efficiently, places ink droplets with amazing accuracy to prevent wasted paper and lasts the lifetime of the printer. Superior 6-colour, versatile and compact all-in-ones featuring Epson iPrint – for easy wireless printing from smartphones and tablets; Epson Creative Print – for printing photos directly from Facebook; Epson Email print – to print from anywhere in the world by emailing photos and documents directly to the printer. The proven 6-colour solution for keen photographers looking to produce and display superior-quality, long-lasting photographs. Claria Photo HD Ink delivers smooth tonal gradations, deep, natural blacks and rich, vibrant colours. 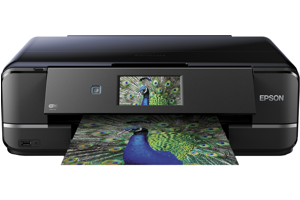 The Expression Photo Series has Wi-Fi®1 with auto-setup to make it simple to connect all your computers and laptops to the printer. In addition you can print from your Android™ and iOS phones and tablets using Epson’s free iPrint app. Ideal for photography enthusiasts and a perfect partner to a DSLR camera, the XP-960 uses Epson's 6-colour Claria Photo HD Inks and can print superior quality photos and text documents in sizes up to A3. Printing large, beautifully detailed photographs is what the cleverly designed XP-960 is all about. Ultra compact, it has a footprint more typical of an A4 printer, but can also deliver fabulously detailed A3-sized prints and photos. With a six-colour Claria Photo HD Ink, dedicated photo paper tray and a speciality rear media feed for A3-sized paper or card, users can create fantastic-looking prints from the comfort of their own home. Not just about printing, the XP-960 can also copy and scan high-quality documents and photos. It's what's on the inside that makes the XP-960 really stand out. From the inks to the printhead, all elements are designed by us and created to work in harmony, resulting in great looking, long-lasting prints. We understand that producing high-quality photos and documents shouldn't just be possible from a computer. With a range of mobile printing options, the XP-960 even makes creating memorable photos from phones and tablets quick and simple. Users can even simply slot in a memory card and follow the helpful menu prompts to print photos without a PC. It may be a cutting-edge A3 printer, but the XP-960 has all the familiar features, too. Fitted with a large easy-to-use touchscreen, dual paper trays as well as a motorised control panel and output tray, creating superior-quality prints has never been easier. The XP-960 is capable of delivering the superior-quality prints demanded by photography enthusiasts shooting in high resolution with a DSLR camera. Making sure photos print in superior quality, the printer uses Epson's six-colour Claria Photo HD ink, which ensures crystal clear results with vibrant colours and deep, rich blacks. They will be long lasting too and photographers can be sure that their exceptional, glossy photos can be enjoyed for generations because prints can last up to 300 years in a photo album¹. Whether using a smartphone or tablet, the iPrint app² can be downloaded to a range of devices for truly wireless printing and scanning. The possibilities don’t end there, with Epson Email Print², it is possible to print from anywhere in the world² by simply emailing documents and photos directly to the printer For creative-minded people the Creative Print² app can access Facebook photos, create custom greeting cards and stationery, and even turn photos into colouring book templates. For added versatility, Wi-Fi Direct allows easy printing from compatible wireless devices without the need for a network connection. Featuring two front-loading paper trays, users can easily switch between different media, eliminating the need to reload paper manually. A rear speciality media feed can hold thicker paper up to A3 in size for truly versatile printing. Printing on suitable CDs and DVDs to create smart digital personalised covers is also possible. A new 10.9cm touch-screen features a user-friendly interactive menu for straight-forward operation. Simply scroll through the options with a simple swipe of your finger, similar to smartphone screen technology. This printer also features a motorised control panel, which automatically opens and moves into position to give easier access to the controls. At the same time, it extends the output tray that collects printouts neatly without manual operation. Both the control panel and out trays automatically close when the printer is switched off. For a quick start, the printer comes with Auto Power On function. The use of individual ink cartridges mean only the colour used needs to be replaced to save on costs. No-one wants to use more paper than they have to, and with duplex printing, the XP-630 instantly cuts paper usage in half. This also has the added bonus of saving money too. No one wants to spend time with cables and manuals setting-up a printer, which is why the user-friendly XP-960 comes with Auto WiFi setup, which configures the settings quickly and securely. With WiFi Direct also included, it's easy to print photos or documents stored on smartphones or tablets even without a home network. Able to quickly make a direct link to your mobile device, the XP-960 can print photos almost immediately, without the need for cables. Users can even siimply slot in a memory card and follow the helpful menu prompts on the LCD screen to print photos without a PC. Stylish and compact - the XP-960's small and lightweight design means it doesn't take up much valuable desk space and is sure to complement any home.